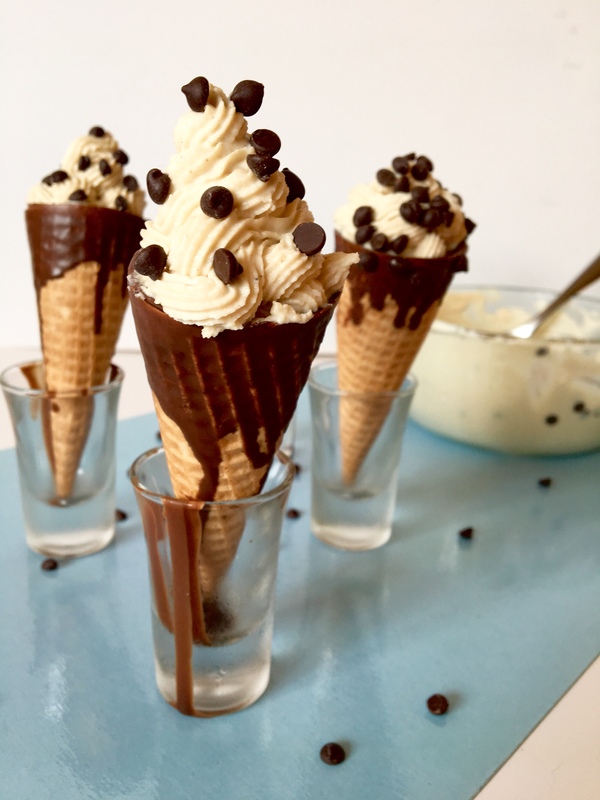 Vegan Cannoli Cones - 8 ingredients, great for parties! Wanna make a kickass vegan cannoli without all the fuss of making your own shells? 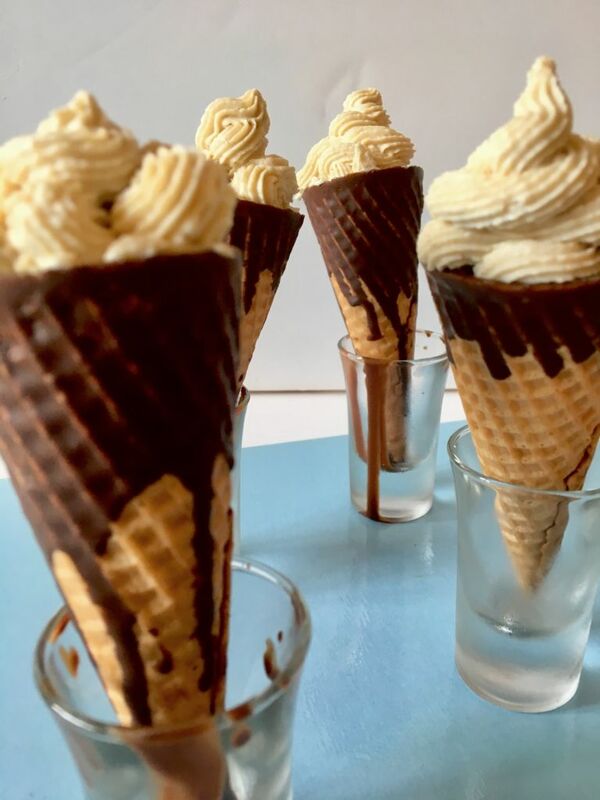 Well, friend, we are happy to report your pastry prayers have been answered in the form of these amazing and super simple Vegan Cannoli Cones! Let me start out by saying this was originally going to be an ice cream recipe. Ice cream cones kinda taste like baked cannoli shells, right? When we searched for this seductive combination on Pinterest, we learned that we were not the first to have this thought. 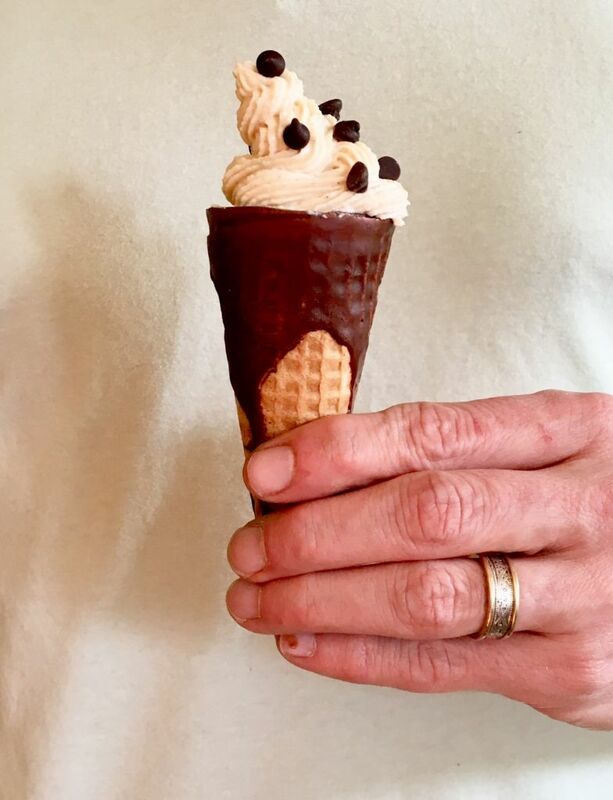 In fact, the cannoli cone has already become something of a Pinterest miracle, but we hadn’t yet seen one made vegan. These vegan cannoli cones would be so perfect for a birthday party or any kind of event, really. You could even set up a little cannoli cone bar with various toppings like chocolate chips, cookie crumbles, strawberries…HOW COOL DOES THAT SOUND?! Okay, maybe my definition of cool is a little skewed 😅, but still…that would be one awesome party in my book. But if you DO wanna get fancy with the piping, we highly recommend stocking your kitchen with a cake decorating kit like this. We are just starting to experiment with ours, and if this recipe is any indication, we will be using it a LOT! Cocoa butter, for those of you who don’t yet know, is the fat extracted from the cocoa bean. It’s used to make everything from chocolate (HELLO, WE LOVE YOU ALREADY) to moisturizing skin and hair care products. You may not find this stuff at your local grocery store, but it’s incredibly easy to purchase on Amazon: We went with the 1-pound bag of this brand here. One pound is actually a lot more cocoa butter than I realized, but that’s okay. I’ve been finding new uses for it every day. Some of which are sure to make their way to this blog over the next few months, so if you decide to order some of this magical stuff, we will definitely not leave you high and dry without recipes for long! Watch us make these Vegan Cannoli Cones in under 60 seconds! 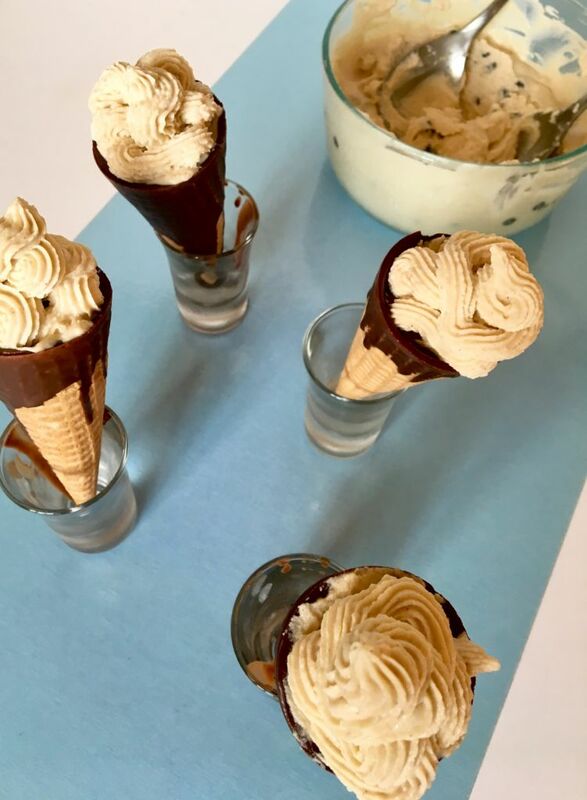 So, the next time you’re throwing a party, shower, or, hell, even on a random Thursday night when the week’s been rough and the cannoli cravings hit you hard, give this vegan cannoli cones recipe a try! And when you do, let us know about it! Tag us in all your adorable vegan cannoli cones photos on Instagram (we’re @theplantpowercouple, with the ‘the’) or Facebook (just Plant Power Couple there). 8-Ingredient Vegan White Chocolate Cannoli Cones that will ROCK your next party or, hell, even a plain ol' Thursday night! These bad boys are so much easier to make than a traditional cannoli but still have all of that incredible creamy / crunchy texture and flavor combo that will make your heart do jumping jacks...seriously. First, melt and measure out your cocoa butter and coconut oil, one at a time. We did this by heating each in a small pan on low heat, stirring until almost completely melted. Then, remove them from heat and stir until completely melted. Now, you can measure them out. You can alternatively use a microwave, just be sure you are at a low heat and stopping often to stir. 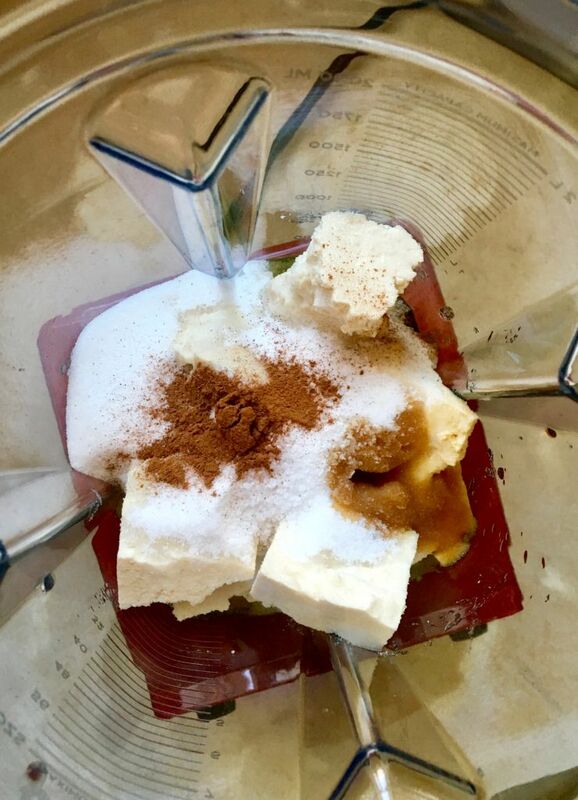 Next, add all filling ingredients (excluding the chocolate chips) to your food processor and blend on high, stopping to scrape down the sides as needed, for about 2-3 minutes or until the oils have emulsified and a thick, luscious texture is achieved. Now, you'll add half of this mixture to a pastry bag and the other half to a freezer-safe container. Stir 2 Tbsp of the chocolate chips into the mixture in the freezer container and place both in the freezer for 30 - 45 minutes to set. If you don't have / aren't comfortable with pastry bags, feel free to skip this step and put all the filling into the freezer container. While your filling sets, prepare your cones (optional): In a small saucepan, add the chocolate chips and coconut oil. Cook on a very low setting, stirring constantly until the mixture is almost completely melted. Then, take it off the heat and stir until completely melted. 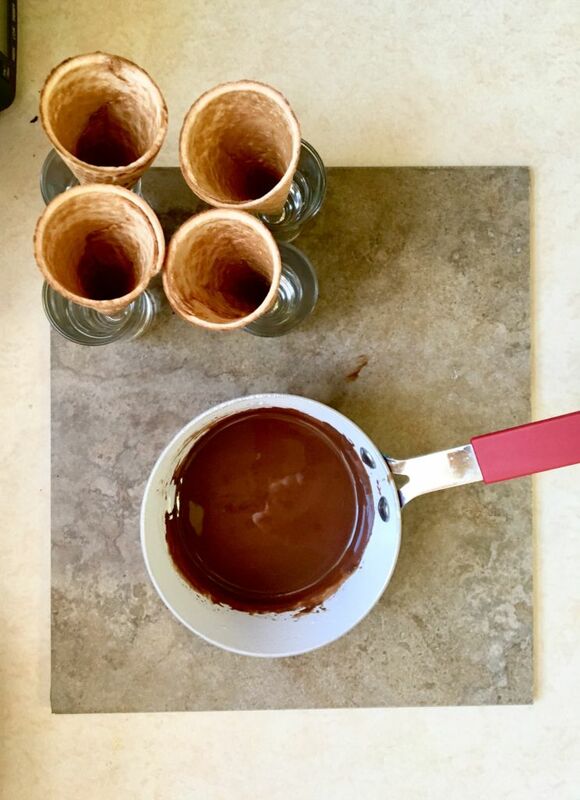 Dip the top of each cone into the melted chocolate and set aside. Then, fill each cone with a small drizzle of chocolate. 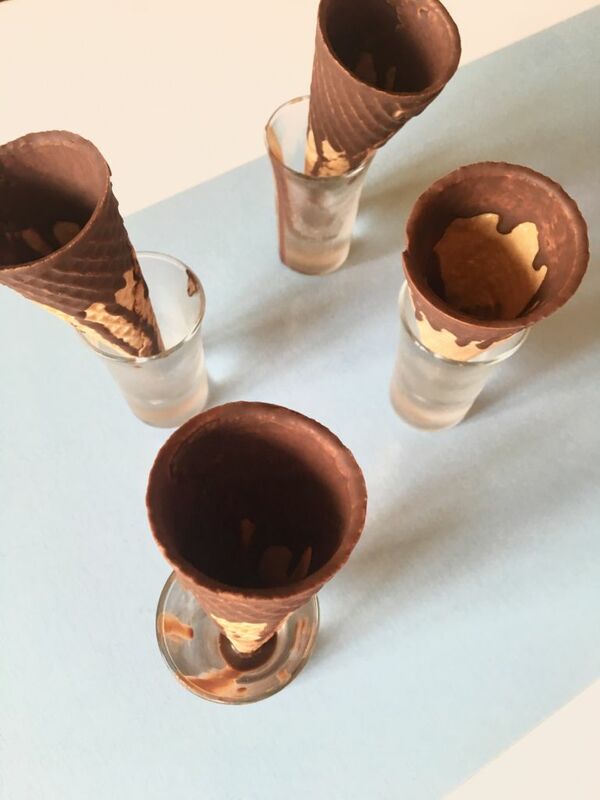 We used shot glasses to keep the cones upright, but any glass / dish will work. Place the cones in the freezer until the filling is ready. When the filling has set, spoon it into the cones until completely filled. Then, pipe on some filling in a circular motion, creating ice cream cone like peaks. Sprinkle with the remainder of the chocolate chips and ENJOY! These vegan cannoli cones are best when eaten immediately. We suggest storing the filling in the fridge in an air-tight container for up to a week. Seriously a brilliant, time-saving idea! And that extra chocolate on the cone is a must...YUM! Lol, right?! 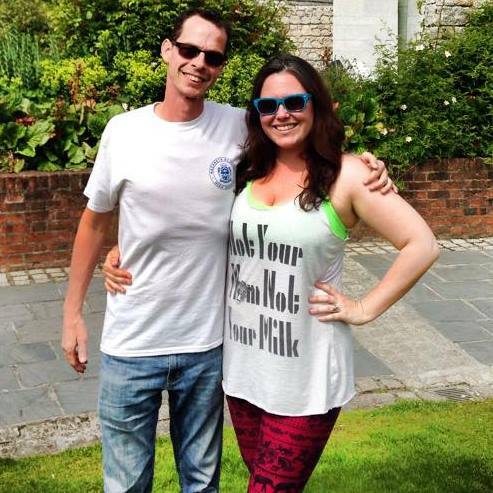 So glad to hear you dig it. Thanks so much, Nicole! This looks so amazing. The texture is spot on! I'm going to try this. I haven't had a cannoli in years! Hell yeah! These look amazing!!! Thank you for making a vegan version, I know they're so much better than dairy. Yay! Thanks so much, Linda! Looks great! Do you think this would work as a cake filling? I’m attempting to make a vegan cannoli cake and need looking for a filling recipe. Thanks! Ooooh, that sounds delicious! As long as the cake is cooled when you add the cannoli filling, I don't see why it wouldn't work. Let us know how it goes!